OLDRIGHTIE: Get Your Punches In First. Get Your Punches In First. 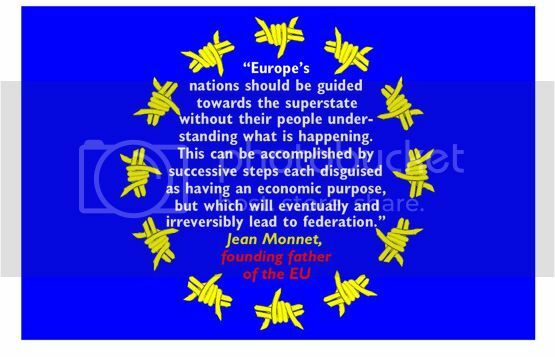 EUSSR Propaganda Already In Overdrive For The UK Referendum. We are preparing for a referendum, at long last. Unfortunately the Common Purpose, Corporate might is already ensconced at the top of a very steep hill. Defeating these powerful, albeit corrupt, battalions and their banker storm troopers is a big ask. Already we are being fed a daily diet of pro this ghastly project of a political EUSSR. These salvos just the early volleys before the really big guns are trotted out during the battle itself. To achieve a sensible rejection of these crooks and their bought and paid for cohorts, such as Mandleson and the Kinnocks, will be nigh on impossible. One glimmer of hope is that despite a similar crushing of all but Miliband's propaganda in the General Election, the dismal failure of the pollsters and punditry en masse, the British people rejected all the blather and against all the odds returned a Conservative majority. May that same deep seated understanding of the dangers of an undemocratic, socialist dictatorship, led by a Fourth Reich, will triumph and we become a proud United Kingdom once more.